The rumor that the Conga mining project would be canceled  and that the workers would be laid off appears to be the precursor of a new series of protests against the project. This rumor spread quickly on the morning of June 10, 2013, provoking the almost immediate appearance of the Minister of Energy and Mining to deny  the report. He stated that the project was going ahead and as far as the workers, there would be a relocation in most cases. These announcements confirming that the mining project would continue working somehow behind the back of the populace resulted in the community members of Cajamarca announcing  a march to be held on Monday, June 17, towards Lake Perol, located within the land intended for the Conga mining project. It was learned that various groups of workers supported  the measure in defense of water resources that supply the agricultural and livestock region of Cajamarca. The resurgence of the protests are worrying  [es] to the parties interested in not losing the big mining projects. The government has also reiterated  [es] the importance of this project in particular, and the decision at the presidential level to support and not hinder these investments. In practice, this meant that in the early hours of Monday the 17th the national police reinforced  [es] security measures at the Cajamarca and Yanacocha plants. For its part, the prosecutor's office of Cajamarca called  [es] for calm and the avoidance of violence during the mobilization. It was also learned  on the morning of the 17th that villagers from Sorochuco, Celendín, Bambamarca and Cajamarca were heading to Lake Perol. Around mid-day it was reported  [es] that between 600 and 700 protesters were already at the lake. By the evening, there were reports  of 2500 or 3000 ronderos (civilian community patrollers) in the immediate vicinity of the lake, with the intent to create a permanent camp for monitoring and preventing Yanacocha from starting to work there. 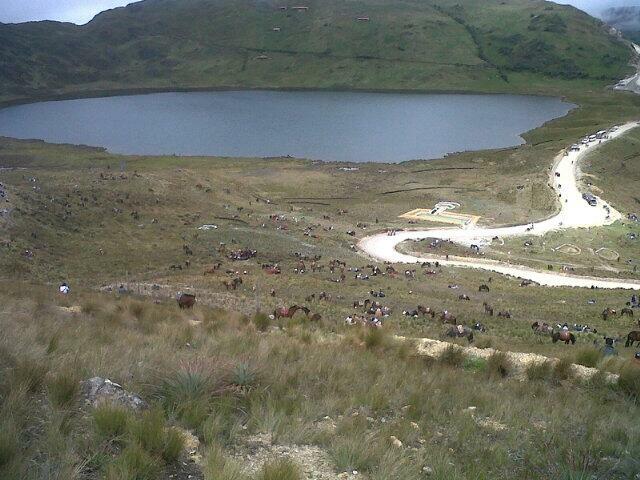 “Thousands of Cajamarca residents are already at Lake Perol. Located in different parts of Conga.” Photo shared by @MattColun on Twitter. “Here is where the camp of Cajamarca, Bambamarca and Celedin residents will be installed. Conga no va. (Protest slogan: Conga won't proceed. )” Photo shared by @MattColun on Twitter. [I am] very concerned about the resumption of the conflict in Cajamarca, without the government trying to seek substantive solutions, to the contrary, it's clear they have lied to the country and they have lied to Cajamarca in saying that the project was at a standstill. There are a lot of police in Cajamarca. In the area near the gate, on the access road to Lake Perol, police detachments can be seen. So far there is no indication of hostilities against the marchers. One fact that caught our attention was the unexpected power outage in the Lucmacucho sector, preventing local radios from transmitting live events from the mobilization. Telesur transmitted a live report  [es] from Lake Perol (video uploaded by user eduin lozano ). Actualidad Ambiental published  [es] several photos from different moments of the march. 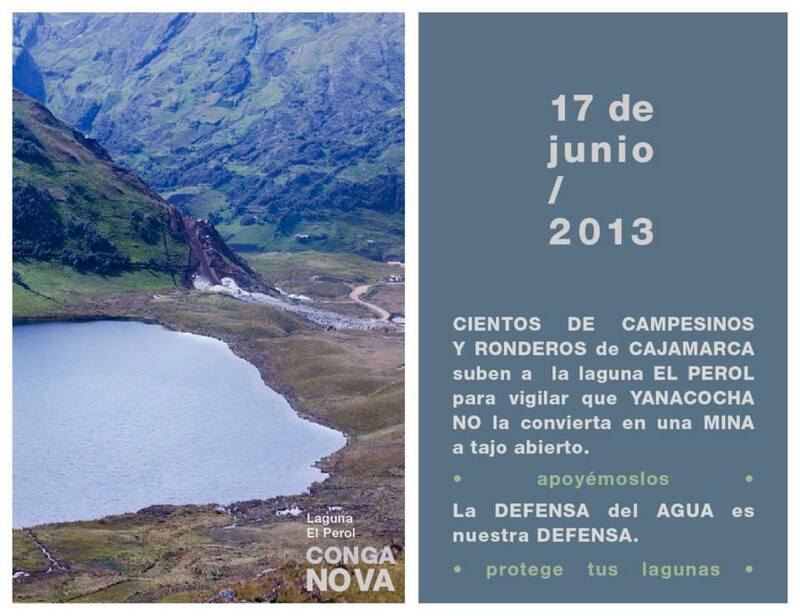 @Puruay : VIGIL in Cajamarca: Lord, we thank you for taking care of our Guardians, to protect our lagoons. 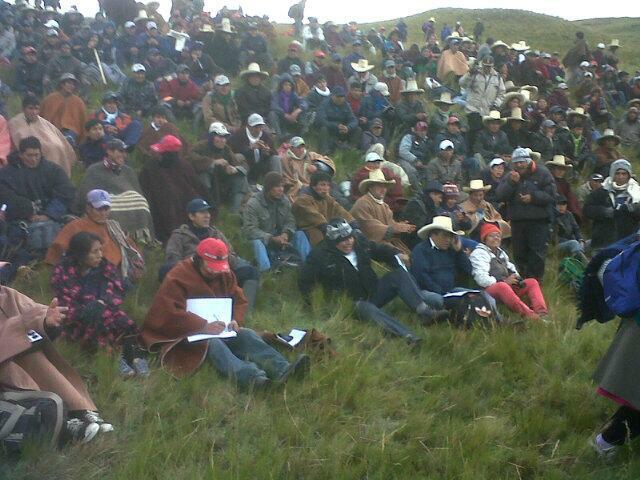 @Indignados_Peru : Conga: The protests continue in Cajamarca and the mining company is minimizing them. Another social conflict in the making…. Although it turned out that  [es] three protesters were arrested, they were later released. The company also later issued a statement  [es] saying there were no injuries or arrests in the protests. However, it was unknown how the situation would develop in the ensuing hours. Post originlly  [es] published in the blog Globalizado by Juan Arellano.